You may recognise Steve as he works for the London Ambulance Service NHS Trust. He may have even been one of the Ambulance personnel that drove you to Hillingdon Hospital. 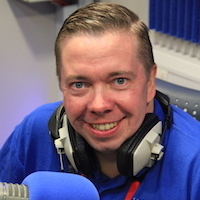 Steve joined Radio Hillingdon in 1993 when he was just 15. During his time as a volunteer he has tried his hand at many different roles at the station. These include Road Show Manager, Fire Officer, Presenter, Committee Member, Fund-raising Co-ordinator, Local News Reporter and currently Chairman. One of his greatest achievements during his time as a volunteer at Radio Hillingdon, is the Hospital Fete. Until recently he organised the fete as an annual event. Unfortunately, due to the unpredictable weather we have had in recent years, the fete no longer takes place. In its heyday, the fete hosted around 50 charity stalls, an arena full of entertainment and raised approximately £3000 for Radio Hillingdon. Steve is also a volunteer member of the British Red Cross Society and can often be found driving their Ambulances at local fetes and events or training members of the public in First Aid. He also enjoys visiting stately homes, socialising over a pint of ale or a malt whiskey and ghost hunting.